When we moved into our house last June we tackled painting and replacing floors but left the half bath off the kitchen to do later. For almost a year now I've looked at an empty box with linoleum flooring and a builders grade basic sink. The walls had not even been painted. 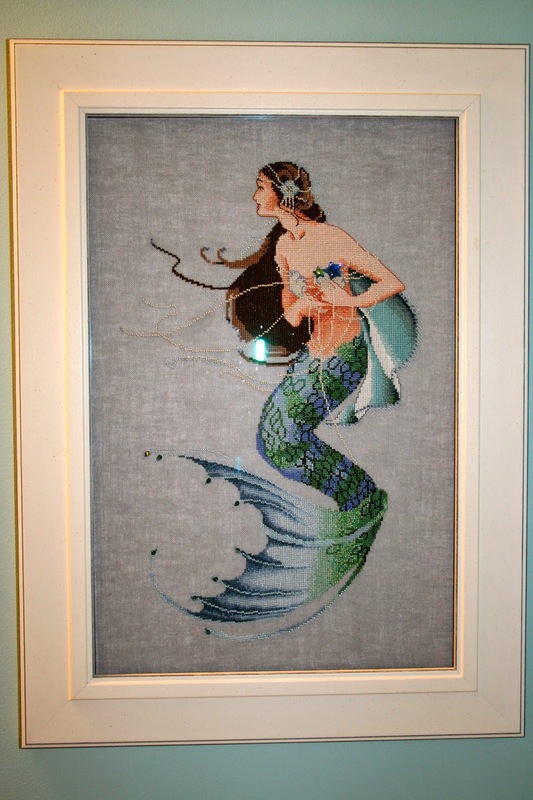 Using the cross stitch of the mermaid that my Mom had given me as inspiration, I set out to remodel. 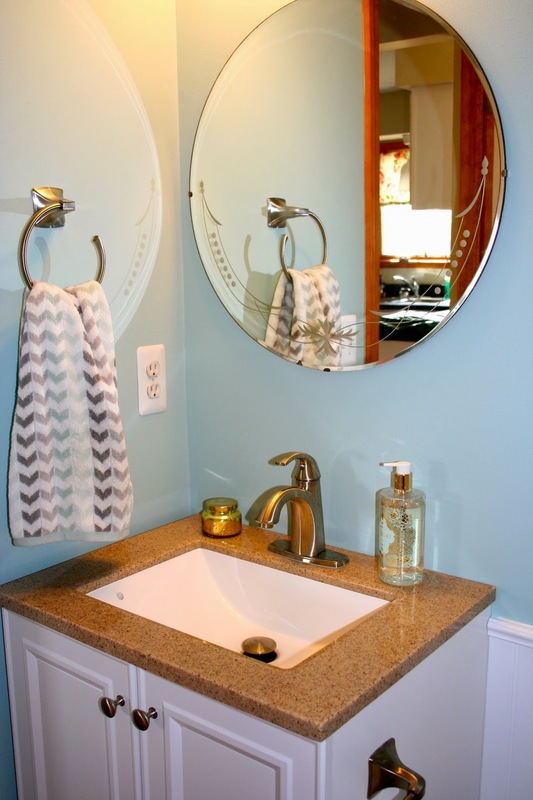 We replaced the sink, added a vintage mirror, put up beadboard and replaced the linoleum with sandy colored ceramic tile. I filled the shelves with beach glass from growing up on Lake Michigan and a favorite set of mermaid salt and pepper shakers. The finishing touch was the Lefton mermaids I was able to score on Etsy. I think they complete the bath perfectly. I clearly have the beach and water on my mind because I've cast on another "Age of Brass and Steam" shawl with the prettiest shade of blue yarn. Have a blessed start to your week! I love it Renee. Those little mermaids are so sweet! Enjoy your new pretty bathroom. Great job Renee! 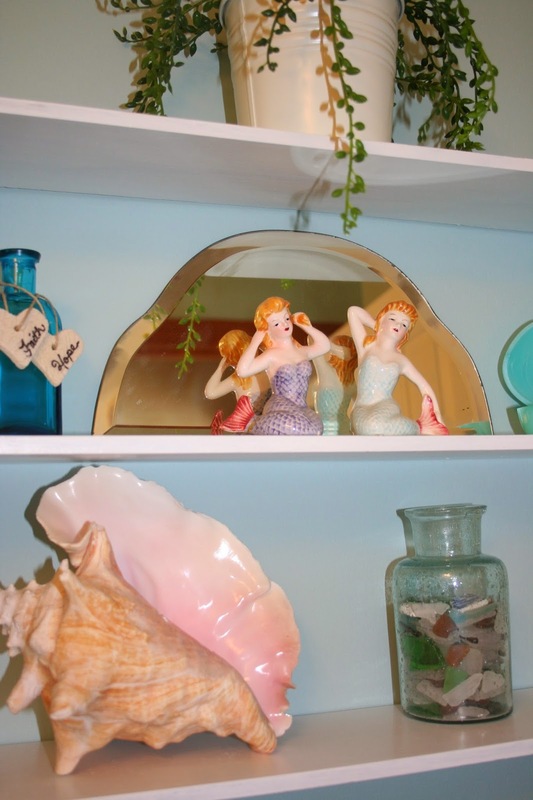 I am loving the vintage mirror and the Lefton mermaids. Etsy is the best for scoring just the right things! OOOOH, you have a kitchen yet to do? Those are a lot of fun! I've got lots of resources if you need any for that. Enjoy! Pretty color and love the bead board. For my birthday, I'll be giving my bathroom a makeover. I'm trying to find the right cabinet. Have found the flooring. Hubby and I will be doing it! Yours turned out so nice. Such a pretty theme, and that mermaid cross stitch is so beautiful! really nice. 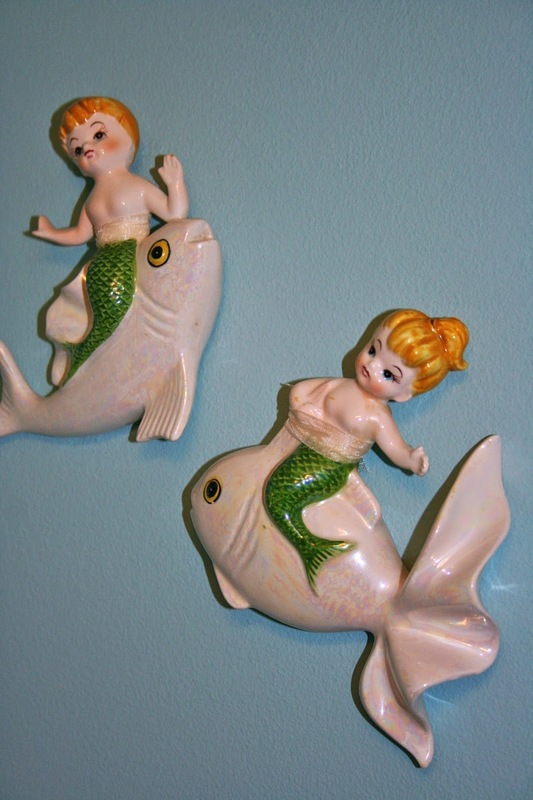 lovin' those mermaids. they remind me of something my grandma might have owned at one time.